This article is about Americans of Dominican Republic descent. For Americans with ancestry from the Commonwealth of Dominica, see Dominican Americans (Dominica). Dominican Americans (Spanish: domínico-americanos, norteamericanos de origen dominicano or estadounidenses de origen dominicano) are Americans who trace their ancestry to the Dominican Republic. The word may refer to someone born in the U.S. of Dominican descent or to someone who has emigrated to the U.S. from the Dominican Republic. As of 2015, there were approximately 1.87 million people of Dominican descent in the U.S., including both native and foreign-born. Dominican Americans are the fifth-largest Hispanic group in the United States. The first person of Dominican descent to migrate into what is now known as the United States was sailor-turned-merchant Juan Rodríguez who arrived on Manhattan in 1613 from his home in Santo Domingo. Thousands of Dominicans also passed through the gates of Ellis Island in the 19th and early 20th centuries. The most recent movement of emigration to the United States began in the 1960s, after the fall of the dictatorial Trujillo regime. Since the establishment of the Spanish Empire, there have historically been immigrants from the former Captaincy General of Santo Domingo to other parts of New Spain which are now part of the United States, such as Florida, Louisiana, and the Southwest. The first recorded person of Dominican descent to migrate into what is now known as the United States, outside of New Spain, was sailor-turned-merchant Juan Rodríguez. He arrived on Manhattan in 1613 from his home in Santo Domingo, which makes him the first non-Native American person to spend substantial time in the island. He also became the first Dominican, the first Latino and the first person with European (specifically Portuguese) and African ancestry to settle in what is present day New York City. Dominican emigration to the United States continued throughout the centuries. Recent research from the CUNY Dominican Studies Institute has identified some 5,000 Dominican immigrants who were processed through Ellis Island between 1892 and 1924. From the 1960s onward, after the fall of the dictatorship of General Rafael Trujillo, larger waves of emigrants have thoroughly transnationalized the Dominican Republic, metaphorically blurring its frontier with the United States. With increased emigration, Dominican diaspora communities have sprouted in New York metro area, New Jersey, Boston metro area, Providence, South Florida, and Philadelphia/Eastern Pennsylvania. Smaller waves of emigrants have settled in the metropolitan areas of Orlando, Tampa, Washington, DC, Baltimore, Rochester, Charlotte, Raleigh, Waterbury, CT, and Danbury, CT. Dominican emigrant communities have similar settlement patterns to that of the Puerto Rican population. Almost half of all the Dominican Americans today arrived since the 1990s, especially in the early part of that decade. There has been another surge of immigration in recent years as immigration from Mexico has declined, which allowed more backlogged Dominican applicants to obtain legal residence. Dominican Americans are the fifth-largest Hispanic or Latino American group, after Mexican Americans, Stateside Puerto Ricans, Cuban Americans, and Salvadoran Americans. As of the latest 2017 Estimates, the majority of Dominican Americans are in a handful of states, including New York (872,504; 4.4% of state population), New Jersey (301,655; 3.3%), Florida (259,799; 1.2%), Massachusetts (172,577; 2.5%), Pennsylvania (127,505; 1.0%), Rhode Island (52,070; 5.1%), and Connecticut (40,343; 1.1%). Around 47% of Dominican Americans live in New York state with 41% in New York City alone, close to 40% of all Dominicans in the city live in the Bronx. Rhode Island has the highest percentage of Dominicans in the country and it is the only state where Dominicans are the largest Hispanic group. Dominicans are the most dominant Hispanic group in most of southeastern New England (Rhode Island and eastern Massachusetts). Dominicans are also starting to be pretty dominant in many areas in North Jersey and the Lower Hudson Valley, including the northern portion of the NYC area like the Bronx and Westchester. In New York City, the borough of Manhattan (New York County) is the only county in the country where Dominicans are the largest ancestral group and its Washington Heights neighborhood has long been considered the center of the Dominican American community. The 2010 Census estimated the nationwide Dominican American population at 1,414,703. About 41% of Dominican Americans live in New York City alone. Many of New York's Dominicans live in the boroughs of the Bronx and Manhattan, and to a lesser degree in Queens and Brooklyn. There are also large populations in other parts of New York State, like Long Island and the Hudson Valley including cities like Yonkers, Haverstraw, Newburgh and as far north as Albany. Across the Hudson River, in New Jersey, a rapidly growing population of up to 250,000 Dominicans reside, topped by Paterson in absolute number and with Perth Amboy having the highest proportion in the U.S. And other areas of New Jersey including cities like Jersey City, Union City, and Newark, and many other areas in Passaic County and Hudson County. In Massachusetts, there is a very large Dominican population throughout the eastern part of the state, in cities like Boston, Lawrence, Lynn and many other parts of the Boston area. Lawrence in particular, has one of the highest percentages of Dominicans in the nation alongside Perth Amboy NJ, Haverstraw NY, and Hazleton PA. In Rhode Island, there is a large Dominican population throughout the state, especially Providence County, including the cities of Providence and Pawtucket. To a lesser extent, Connecticut has small Dominican populations in Fairfield County and New Haven County, including the cities of Waterbury, Danbury, Bridgeport, and Stamford. In Pennsylvania, there are sizeable Dominican populations in the eastern portion of the state, including Philadelphia, Hazleton, Bethlehem, Allentown, and Reading. Hazleton in Pennsylvania, has one of the fastest growing Dominican communities in the nation, going from 1 percent in the 2000 census to about 35 percent according to the 2017 estimate. There are also large Dominican populations in Florida, including in Miami, Pembroke Pines, Orlando, Kissimmee, Tampa, and many other parts of the Miami and Orlando metropolitan areas. There are also much smaller but growing Dominican populations in states like New Hampshire, Delaware, Maryland, Virginia, North Carolina, Georgia, Ohio, Texas, and California. Since 2010, there has been huge increases in the Dominican population in New York City (especially the Bronx), but also significant increases in cities like Boston, Philadelphia, Miami, Orlando, and many smaller cities throughout the coastal Northeast. According to recent 2014 estimates, Boston and New York City are the only major cities where Dominicans are now the largest Hispanic group, recently surpassing Puerto Ricans in both cities, due to slower growth (or decline) of the Puerto Rican populations in those cities and much faster growing Dominican populations. However, in both cities, Dominicans make up only a plurality of the Hispanic population. As of 2017, the New York metropolitan area, which includes southern New York state and North Jersey, has nearly 1.1 million Dominicans, making up about 5.3 percent, the highest percentage of any metropolitan area. However, the Boston metropolitan area is the only metropolitan area where Dominicans are the largest Hispanic/Latino group, recently surpassing Puerto Ricans. Since 1980, the Census Bureau has asked U.S. residents to classify their race separately from their Hispanic or Latino origin, if any. In 2010, 29.6% of Dominican Americans responded that they were white, while 12.9% considered themselves black. A majority of 57.5% chose the category 'Other race'. The prevalence of the 'other race' category probably reflects the large number of people who identify as mixed African and European ancestry in the Dominican Republic, where 73% of the population identified as being of mixed European and African descent, commonly known as mulatto, similar to other Caribbean Latinos. Genetically, some are tri-racial, however, having also Taíno Native American ancestry. According to the 2013 Pew Research Center survey there is an estimation about 1.8 million of Dominican origin that are residing in the United States which account for 3.3% of the US Hispanic population in 2013. When they were asked to identify themselves about 66% of them said they used the term 'Dominican', 16% use 'Americans', and 17% use the terms 'Hispanic' or 'latino'. Those that prefer the term Hispanic is 29%, 11% prefer the term 'Latino', and the rest have no preference for either of the terms 'latino' and Hispanic. When they were asked if they believed to be American about 53% did see themselves as American, 49% Hispanics adults were more likely to see themselves as typical American than the 44% that saw themselves different from the typical American. Dominican Americans have a Latin Caribbean culture similar to Puerto Ricans and Cubans, they also have very high intermarriage and procreation rates with Puerto Ricans. 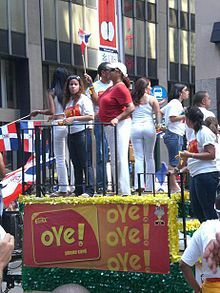 The Dominican Day Parade in New York City, a major destination for Dominican emigrants. Paterson, New Jersey, known as the "Silk City" in the New York City Metropolitan Area, has become a prime destination for one of the fastest-growing communities of Dominican Americans, who have now become the largest of more than 50 ethnic groups in the city, numbering in the tens of thousands. A Dominican American grocery store. A significant number of Dominican Americans are young, first-generation immigrants without a higher education, since many have roots in the country's rural areas. Second-generation Dominican Americans are more educated than their first-generation counterparts, a condition reflected in their higher incomes and employment in professional or skilled occupations and more of them pursuing undergraduate education and graduate degrees. Over 21% of all second-generation Dominican Americans have college degrees, slightly below the average for all Americans (24%) but significantly higher than US-born Mexican Americans (14%) and US-born Puerto Rican Americans (9%). In New York City, Dominican entrepreneurs have carved out roles in several industries, especially the bodega and supermarket and taxi and black car industries. Tom Perez is the current chairman of the Democratic party. Over two dozen Dominican Americans are elected local or state legislators, mayors or other in New York, New Jersey, Rhode Island, Maryland, Massachusetts, and Pennsylvania. Dr. Eduardo J. Sanchez was the Commissioner of Health for the state of Texas from 2001 to 2006, and Lorraine Cortés-Vázquez, of Puerto Rican and Dominican descent, held her post as New York Secretary of State from 2007 to 2010. In November 2016, Adriano Espaillat became the first Dominican-American to be elected to the United States Congress, he represents New York's 13th Congressional District which is predominantly Dominican-American. He also became the first formerly undocumented person to be elected to the Congress. The electoral participation of Dominicans in the United States may improve as a result of the 1994 approval of dual citizenship by the Dominican legislature, which makes it easier for migrants to become U.S. citizens without relinquishing their Dominican nationality. A 1997 Dominican law, which took effect in 2004, allows Dominicans living abroad to retain their Dominican citizenship and voting rights even if they become citizens of another country. Traditionally, Dominicans living in the United States are passionately involved in politics "back home", but unlike other Hispanic or Latino national groups, such as Cuban Americans and Mexican Americans, they are not as inclined to take an active part in U.S. politics, but recent research has shown an increasing involvement in this area. For a more comprehensive list, see List of Dominican Americans (Dominican Republic). Junot Diaz drew on his life and the Dominican American experience generally in authoring Drown and The Brief Wondrous Life of Oscar Wao, the latter of which won him the Pulitzer Prize for Fiction in 2008 and made him the first Dominican American and the second Hispanic or Latino American in history to win the Pulitzer Prize. Julia Alvarez is the nationally recognized author of In the Time of the Butterflies, a fictional book based on the lives of the Mirabal sisters, and How the García Girls Lost Their Accents. Nelly Rosario, born in the Dominican Republic and raised in New York City, also won critical acclaim for her debut novel Song of the Water Saints. Dominican Americans have increasingly made a presence in the financial industry. Cid Wilson was ranked #1 Wall Street financial analyst in the Specialty Retailing category by Forbes in 2006. On July 14, 2014, he was named President & CEO of the Hispanic Association on Corporate Responsibility (HACR) in Washington, DC, thus becoming the first Afro-Latino to lead a major national Hispanic organization in the U.S.
Julio A. Portalatin, Chairman & CEO of Mercer LLC (subsidiary of Marsh & McLennan Companies) is the highest ranking Dominican American Fortune 500 executive in the U.S. Traditional Dominican cuisine has translated well to the United States as Dominican Americans have opened reputable restaurants throughout the diasporic communities. Traditional cuisine is very colorful with red and green peppers and cilantro. Traditional cuisine consists of rice, beans, tostones (known as fritos), and a meat like chicharrón de pollo (deep-fried chicken), Mangú (mashed green plantains served with sautéed onion), slices of avocado, fried eggs, salami, empanadas and pastelitos (fried meat pies), and sancocho (stew of meats, potatoes, and vegetables). The most well known drink is "Morir Soñando" which translates to "die dreaming." It is a drink of orange juice, cream, and vanilla. Desserts include flan, bread pudding, rice pudding, and tres leches. Dominican restaurant owners in the diasporic community really aim to conserve the taste of the mainland as they feel that is what immigrants seek out when looking for authentic Dominican cuisine. Achieving that taste is not hard in the United States as most grocery stores stock Dominican, Puerto Rican, and other Latin American products made by Goya Foods. Dominican Americans take pride in their food from their homeland and they use it as a symbol in times of celebration. For example, when the Dominican Republic won the World Cup of Baseball, Dominican Americans cheered carrying plantains. The experience of Dominican-American cuisine goes beyond the consumption of the food, however. It is vitally integrated into the everyday culture of the Dominican-American community. Through the sensations of eating, to the act of cooking, Dominican-American food is part of the Dominican-American experience. Dominican food is an integral part of the formation and maintenance of the Dominican diaspora. According to Liberato and Feagin's section in the Other African Americans eating traditional Dominican food ties second generation Dominican Americans to the diasporic homeland. Dominican food and other cultural practices like speaking Spanish help newly immigrated Dominicans situate themselves in the racial hierarchy of the United States. The U.S. Census data from 2000 showed that Dominicans "have the largest concentration of people below the poverty line." When racial categories that apply on the island are no longer pertinent in the U.S. and Dominican immigrants use features of Dominican culture- like cooking traditional fare- to differentiate themselves from Native Black Americans to help themselves establish a unique identity. Designer Oscar de la Renta, born in the Dominican Republic to a Dominican mother and a Puerto Rican father, is one of the most recognized names in the fashion industry. Maria Montez was dubbed "The Queen of Technicolor" for the numerous Hollywood adventure films that she starred in the 1940s. Zoe Saldana, the female leading star of the movie Avatar, is an actress born in New Jersey to a Dominican father and a Puerto Rican mother. Michelle Rodriguez, born of a Dominican mother and a Puerto Rican father, is known for her roles on the television series Lost and the movies The Fast and the Furious, S.W.A.T. and Resident Evil. Dania Ramirez is known for playing Callisto in X-Men: The Last Stand, Sadie in Quarantine, Alex on Entourage, and Maya Herrera on Heroes. Merlin Santana was a New Yorker whose most notable role was as Romeo on The Steve Harvey Show. Carlos De La Mota, born in New York to Dominican parents and raised in La Vega, and José Guillermo Cortines are popular telenovela actors who often work stateside. Claudette Lali is a former model turned actress also born in New York and raised in the Dominican Republic. Charytín is an actress, singer, dancer, and television host who has been a longtime fixture in the U.S. Hispanic/Latino media. Tina Aumont, Miguel A. Nuñez, Karen Olivo (a Tony Award-winner), Victor Rasuk, Judy Reyes, Shalim Ortiz (son of Charytín) and Tristan Wilds also have Dominican origin. Also increasing is the Dominican American profile in government and politics. Milestones along the way have been marked, among others, by Guillermo Linares and Kay Palacios, the first Dominican Americans elected in the United States, as former New York City Council Member and former Englewood Cliffs, New Jersey city council respectively; Marcos Devers, the first Dominican American mayor in the U.S., who was appointed as Acting Mayor of Lawrence, Massachusetts; Passaic, New Jersey mayor Dr. Alex D. Blanco, the first Dominican American mayor ever elected in the United States; Also, the first person of Dominican descent elected anywhere in the U. S. was former New York assemblyman Arthur O. Eve, serving parts of Buffalo, NY from 1966 to 2002 http://instituteforlatinostudies.org/2016/09/first-dominican-elected-to-public-office-in-the-united-states-of-america-to-receive-lifetime-achievement-award/. The first Dominican American New York County Supreme Court Judge was Rolando T. Acosta; Camelia Valdes, the first Dominican American to become a head Prosecutor or District Attorney in U.S. history; Adriano Espaillat and Grace Diaz, respectively the first Dominican American person and the first Dominican American female to be elected to a state legislature in the United States; Juan Pichardo, Rhode Island State Senator, the first Dominican American to be elected State Senator in the United States. 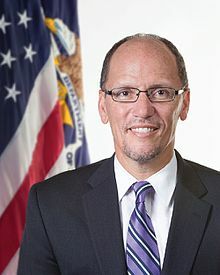 President Barack Obama made his first major Dominican American appointment on March 13, 2009 when he nominated Thomas E. Perez to be Assistant Attorney General for Civil Rights. Perez was confirmed by the U.S. Senate on October 6, 2009. Angel Taveras, mayor of Providence, Rhode Island, is the first Hispanic mayor of the city, the third elected, and the fourth serving Dominican American mayor in the United States. Juan Manuel Taveras Rodríguez was a Professor Emeritus at Harvard Medical School and Radiologist-in-Chief Emeritus of the Massachusetts General Hospital. He is widely regarded as the father of the medical specialty of neuroradiology, having co-authored the first textbook of this specialty and founded both the American Society of Neuroradiology and its journal, of which he served for several years as editor. Dominican music includes above all merengue and bachata. Bachata, as well as reggaeton, have become popular among many Dominican American youth, as have house, salsa, rock, hip hop and other musical genres. Some notables in the music industry include: bachata singers Prince Royce and Leslie Grace, Fuego Merengue singer, Ralph Mercado, founder of RMM Records and music producer; Johnny Pacheco, singer, godfather of New York salsa; Karina Pasian, singer and pianist; Proyecto Uno, merengue hip-hop group; Anthony Romeo Santos, singer and songwriter; Rosanna Tavarez, Rita Indiana, singer and songwriter, singer and television host; Ivan Barias, music producer and songwriter. In September 2017, New York-based rapper Cardi B became the first person of Dominican Republic descent to reach number one in the history of the US Billboard Hot 100 chart, since it was launched in 1958. Dominican Americans have made great strides in the field of baseball, the community's favored sport. Alex Rodriguez, New York-born, is the most well-known Dominican American in this field. He is the highest-paid player in Major League Baseball (MLB), and one of the most famous athletes in the United States. The larger portion of MLB players of Dominican origin immigrated from the Dominican Republic, number in the hundreds, and count among them Robinson Canó, Jose Bautista, Rafael Soriano, David Ortiz, Albert Pujols, Edwin Encarnacion, Hanley Ramírez, Manny Ramírez, Bartolo Colón, and Hall of Fame members Juan Marichal and Pedro Martínez. Some of them, including Pujols (2007), David Ortiz (2008), Canó (2012), and Colón (2014), have obtained U.S. citizenship. Dominican natives Felipe Alou and Tony Peña were managers, and Omar Minaya is a general manager in (MLB). Basketball has seen the likes of Felipe López, Francisco Garcia, and the father-son pair of Tito and Al Horford, all originally from the Dominican Republic, as well as Charlie Villanueva and 2015 NBA draft top pick Karl-Anthony Towns from the New York area. In the National Football League (NFL) there are Luis Castillo, Tutan Reyes and Dante Rosario. Among other notables of full or partial Dominican origins are Nancy Alvarez, sexologist and talk show host in Spanish-language media; Susie Castillo, Miss USA 2003; Mary Joe Fernández, a tennis player and television commentator; Geovanny Vicente Romero, a community leader and political analyst in Washington, D.C.; Providencia Paredes, an assistant and confidante to Jacqueline Kennedy Onassis; and Ilka Tanya Payan, an AIDS/HIV activist, actress, and attorney. ^ a b Data Access and Dissemination Systems (DADS). "American FactFinder - Results". Factfinder.census.gov. Retrieved 17 March 2015. ^ "B03001: Hispanic or Latino Origin by Specific Origin, 2015 American Community Survey 1-Year Estimates". United States Census Bureau. Retrieved September 12, 2017. ^ Sam Roberts (October 2, 2012). "Local History: Honoring a Very Early New Yorker". The New York Times. Retrieved January 14, 2016. ^ a b "Preview of Research Findings October 22: Dominican Immigration Through Ellis Island - CUNY Dominican Studies Institute News". Cunydsi.typepad.com. Retrieved 17 March 2015. ^ "Juan Rodriguez Archives - Voices of NY". Voices of NY. Retrieved March 17, 2015. ^ a b c "Ancestry Map of Dominican Communities". Epodunk.com. Retrieved January 26, 2008. ^ a b c d "Dominican Materials3" (PDF). United States Census Bureau. p. 14. ^ a b "2010 Census". Medgar Evers College. Archived from the original on June 11, 2010. Retrieved April 13, 2010. ^ "N.J. city tops Dominican population in the U.S., census says". DominicanToday.com. January 30, 2009. Archived from the original on September 23, 2015. Retrieved June 29, 2015. ^ "Dominicans now outnumber Puerto Ricans in NYC". New York Post. Retrieved March 17, 2015. ^ "NYC's Dominican population surpasses Puerto Rican community for first time". Fox News Latino. Retrieved March 17, 2015. ^ Fuente: Encuesta Latin American Public Opinion Project, LAPOP, "La variable étnico racial en los censos de población en la República Dominicana" (in Spanish). Oficina Nacional de Estadística. Archived from the original on July 29, 2013. ^ Silvio Torres-Saillant (2010). "Introduction to Dominican Blackness" (PDF). City College of New York - Dominican Studies Institute. Retrieved January 14, 2016. ^ "Hispanics of Dominican Origin in the United States, 2013". Pew Research Center's Hispanic Trends Project. 2015-09-15. Retrieved 2018-05-23. ^ Sonya Tafoya (December 6, 2004). "Shades of Belonging" (PDF). Pew Hispanic Center. p. 6. Retrieved January 14, 2016. ^ Eduardo Bonilla Silva (2002). "We are all Americans! : the Latin Americanization of racial stratification in the USA" (PDF). Texas A&M University. pp. 6–8. Retrieved January 14, 2016. ^ "City of Paterson - Silk City". Retrieved April 2, 2013. ^ Valencia, Laura (September 8, 2013). "Thousands celebrate their heritage in Paterson's Dominican Parade". North Jersey Media Group. Retrieved September 9, 2013. ^ a b c Data Access and Dissemination Systems (DADS). "American FactFinder - Results". Factfinder.census.gov. Retrieved 17 March 2015. ^ Data Access and Dissemination Systems (DADS). "American FactFinder - Results". Factfinder.census.gov. Retrieved March 17, 2015. ^ a b Castro, Max J. (2002). The Dominican Diaspora Revisited, Dominicans and Dominican-Americans in a New Century. ^ "Elected Officials". Dominican American National Roundtable. Archived from the original on November 1, 2010. Retrieved February 11, 2010. ^ "Dr. Eduardo Sanchez addresses DANR 8th Annual National Conference". Archived from the original on July 29, 2007. ^ "NY Sec. of State Lorraine Cortes-Vazquez to addresses DANR 11th Annual National Conference". Archived from the original on January 15, 2009. ^ Lorraine Cortés-Vázquez to Head AARP's New Multicultural Strategy, aarp.org, July 29, 2010. ^ Castro, Yahaira (October 26, 2004). "FRONTLINE/WORLD. Election 2004 – Dominican Republic". PBS. Retrieved June 9, 2008. ^ "DANR Congratulates Junot Diaz as first Dominican American To Win Pulitzer Prize". Archived from the original on January 15, 2009. ^ "Junot Díaz wins Pulitzer for 'Oscar Wao'". Archived from the original on April 14, 2010. ^ "Julia Alvarez interview: In the time of discovery". The Writer. August 4, 2016. Retrieved March 5, 2017. ^ "DR-1 Daily News – May 4, 2006". Dr1.com. Retrieved 13 October 2017. ^ "The Best Analysts – Earnings Estimators". Forbes.com. Retrieved 13 October 2017. ^ "Cid Wilson: 'When we succeed, we give back. When we give back, we succeed'". aldianews.com. Retrieved 8 August 2018. ^ "Julio Portalatin, Diversity Journal Profile". diversityjournal.com. Retrieved 12 January 2015. ^ a b ["Health, Culture and Cuisine in the Dominican American Community." Personal interview. March 27, 2013. ^ Marte, Lidia. "Dominican Migrant Cooking: Food Struggles, Gendered Labor, and Memory Work in New York City." Food and Foodways 20, no. 3–4 (2012): 279–306. ^ Pizarro, Max (June 30, 2009). "Corzine to swear-in Blanco tomorrow with Menendez also in attendance". PolitickerNJ. Retrieved November 3, 2009. ^ "DANR Congratulates Camelia Valdes As The First Dominican American In U.S. History To Head A Prosecutor's Office". Archived from the original on July 25, 2011. ^ "Valdes sworn in as New Jersey's first Latina Prosecutor". ^ "Senator Juan M. Pichardo". State of Rhode Island General Assembly official site. Archived from the original on June 24, 2007. ^ "President Barack Obama nominates Tom Perez as Assistant Attorney General for Civil Rights". The White House (Press release). March 13, 2009. Archived from the original on April 5, 2009. ^ Smith, Michelle R. (January 3, 2011). "New Providence Mayor Angel Taveras sworn in". The Boston Globe. Associated Press. Retrieved January 3, 2011. ^ "Cardi B Becomes First Person of Dominican Descent to Reach No. 1 on the Billboard Hot 100". Remezcla.com. September 25, 2017. Retrieved October 13, 2017. ^ "Colon, wife become U.S. citizens". Espn.go.com. Retrieved October 13, 2017. ^ "Meet Geovanny Vicente Romero - Carlos Rosario". Carlosrosario.org. July 29, 2016. Retrieved October 13, 2017. ^ Leayman, Emily. "Adult charter school helps immigrant thrive in U.S." Watchdog.org. Retrieved October 13, 2017. Krohn-Hansen, Christian. Making New York Dominican: Small Business, Politics, and Everyday Life (University of Pennsylvania Press; 2013) 336 pages; A study of Dominicans in New York City focusing on immigrant entrepreneurs in the bodega and supermarket and taxi and black car industries. Lima, Alvaro, Mark Melnik, and Jeremy B. Thompson. "Imagine All the People: Dominican Immigrants in Boston." New Bostonian Series: 1–12; A comprehensive look at Dominican immigrants in Boston that includes statistics on population concentration of Dominican Americans throughout the city, historical information that informs immigration patterns, and contributions of Dominican Americans to local economies. This page was last edited on 28 March 2019, at 14:18 (UTC).